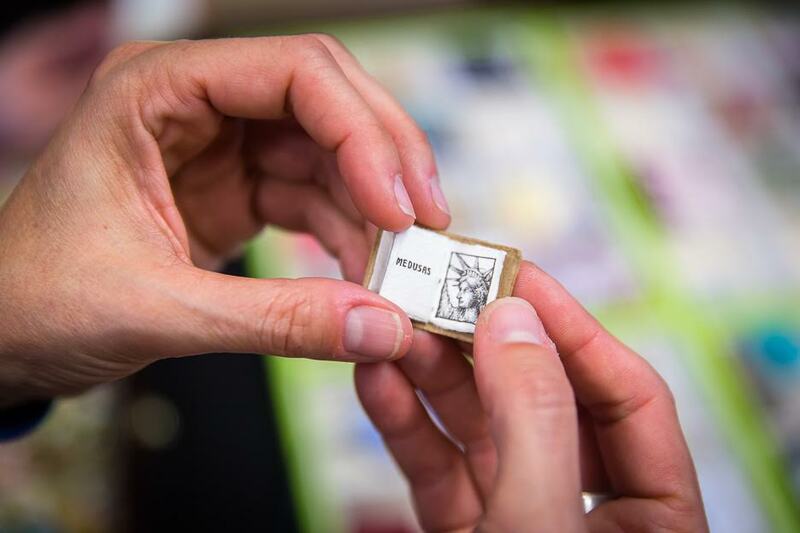 Let Me Tell You: Tiny Books, Big Ideas - an exhibition of miniature handmade books - is open to anyone who would like to participate. The final collection of tiny books will be shown at Drop Forge & Tool in Hudson, NY from May 22 to June 25, 2017. The exhibition is co-presented by Drop Forge & Tool and The Creativity Caravan. Opening reception will be May 22 from 6 to 8pm with a reading at 7pm. Subject: Every one of us is an expert at something and every one of us has something they would like others to know. Now is your chance to share your expertise in a miniature format. Inspired by The Creativity Caravan’s original collection of “How To” books, we encourage participants to submit books on the theme of sharing knowledge. Possible prompts for content: What is your super power? What do you know? Who taught you what you know? What do you want to offer the world right now? How do you positively impact your family, neighborhood, or the planet? What are the things you love about your community? What would you like others to know about you? Form: For the purposes of this exhibition, a tiny book is one that is 3 inches or smaller in all dimensions. Any type of book form or book construction qualifies (within the size restriction). Each participant may submit up to 3 books. All submissions will be shown. Submission Fee: To encourage local participation, there is no submission fee for participants who live in Hudson, NY. For participants who live further afield, there is a small fee of $5 for each book submitted to cover our administrative and display making costs. If the fee is prohibitive, please let us know. We do not want the fee to prevent anyone from participating! Sales: If participants would like their tiny book to be for sale at the exhibit, please indicate a price. Participants will receive 50% of the sales price if their work is sold. Please mark your work Not For Sale if you do not want to sell it. All unsold work can be picked up at the end of the exhibit. HARD & FAST DUE DATE: MAY 15th - All pieces are due. Mailed books must arrive by this date. NEW Mailing Address: Drop Forge & Tool, 10 1/2 Aitken Avenue, Hudson NY 12534. Include book title, price (if selling) and your email address for Paypal payment of any proceeds. In person drop off: Sunday May 14 between 10am and 4pm or Monday May 15 between 1pm and 5pm at Drop Forge & Tool, 442 Warren St, Hudson NY. If you would like to drop off your book(s) earlier, please contact submissions@dropforgeandtool.com to set up a time. OPENING READING AND RECEPTION: 6 to 8pm Monday, May 22. Reading at 7! Let us know if you would like to read your own or another's book! Optional for promotion: By May 10. Email a photo of your piece plus your name, title, dimensions, medium, retail price (suggested retail under $250, and remember the gallery takes 50% commission), and your Instagram handle too! The Creativity Caravan , co-founded in 2013 by Amy Tingle and Maya Stein, is a studio, gallery, and imaginarium located in Northern New Jersey. Their mission is to spark, engage, and nourish creativity in communities everywhere. They believe creativity can change lives by building self-confidence, harnessing imagination, helping to practice problem-solving, and bridging differences. Their programs are centered on the joy of discovery and power of collaborative learning. They offer art and writing experiences for kids and adults of all ages and abilities. They have a brand-new studio space located at 28 South Fullerton Avenue in Montclair, NJ, and their vintage caravan, MAUDE (Mobile Art Unit Designed for Everyone) allows them to deliver their programs locally and beyond.